Jessica was looking amazing on the red carpet of Molly’s Game premiere on Monday night (Dec 4) at Callao Cinema in Madrid, Spain. She wore a swoon-worthy Ralph Lauren Collection evening dress, joined by amazing Piaget jewelry..
On her Instagram, she shared a cute photo of her travel company: her mom! Jerri Chastain will be accompanying Jess in Europe! Traveling through Europe with my Mama @mollysgamemovie press tour ???? Jessica attended earlier this morning a photocall for Molly’s Game in Madrid, starting the European part of the movie promotion. We have some pictures added in our gallery. 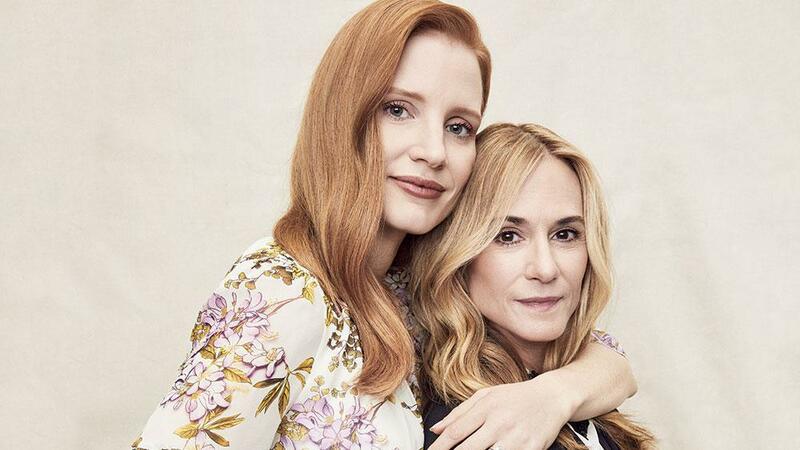 Last month Jessica and Holly Hunter took part of Variety’s Actors on Actors. Variety finally released the full (or the almost 30 min length video) of her interview, which you can watch below. The seventh season of Variety‘s “Actors on Actors,” presented by Google Home, will air from Jan. 2 to Jan. 4 at 7 p.m. on PBS SoCal KOCE. Jessica did an interview to Londonian newspaper Evening Standard, as part of Molly’s Game promotion. A excerpt has been published on today’s issue, with the full coming tomorrow on the supplement ES Magazine. Jessica Chastain accepts she might be blacklisted for her stance on equal pay but feels it’s a risk worth taking. The actress says she is taking a stand against the gender pay gap in Hollywood, adding: “I’m not going to get paid a third less than my male co-star who has equal experience. I uploaded in our gallery the newspaper scan also the pretty new photo accompanying the article. We’ll provide scans of the magazine as soon it’s released. Edit: The full interview is up in our press archive. Plus additional pictures added in our gallery and digital scans. Jessica’s motivation when comes to promote her movies are really something else. She’s at full power promoting Molly’s Game and yet found time to travel to Japan to promote The Zookeeper’s Wife, that will be released next month (December 15). We have the first pictures added in our gallery, so, enjoy! While in Taiwan, Jessica made a photoshoot to Piaget (her hair stylist posted on his Instagram a pre-shoot boomerang) and Marie Claire made a behind-the-scenes interview with her, that was now posted in their Youtube Channel. Check it below, and also screen captures in our gallery. Jessica attended earlier today the Golden Horse Awards — aka Taiwan’s equivalent of the #Oscars — presenting an award alongside Ang Lee. The ceremony was transmitted live – which I obviously missed – but the user Milener Piano uploaded some videos on Instagram. Check in our gallery some pictures added. Hopefully more will surface later. Jessica attended a screening of Molly’s Game in New York this Saturday (17). At the BAFTA screening she was joined by Brian d’Arcy James, Jeremy Strong, Bill Camp and director Aaron Sorkin. She looked stunning in a cobalt blue midi dress by Victoria Beckham, as you can see in the pictures added now at the gallery. Molly’s Game is at full force on promotion, since it received great reviews and we can expect Jessica do more appearances until its release in select cities on December 25, 2017. Jessica stopped by this Friday night at The Tonight Show for a very funny interview with Jimmy Fallon, as part of the Molly’s Game promotion. Usually during the interviews, Fallon always shows up some game but tonight they put up a video showing the sexism behind the casting calls. I have the entire interview uploaded, which you can watch below. Also check screen captures added to the gallery. Jessica attended a MoMa screening of Molly’s Game this Friday (17) at the Museum of Modern Art’s Department of Film in New York. She was joined by director Aaron Sorkin, Brian d’Arcy James and Jeremy Strong and you can now find pictures in our gallery.